This Analog to Digital Audio Converter is used to convert a standard stereo signal (L/R RCA or 3.5mm) to a digital audio signal. Great for connecting older devices with standard RCA output to newer sound systems via an optical cable or digital coaxial cable. This Composite (yellow, white and red RCA) and S-Video to HDMI Converter allows seamless integration for devices of last generation into HDMI equipped devices of today. 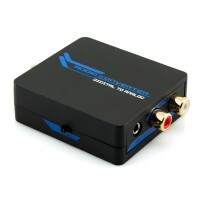 Features a L/R RCA stereo audio connection to mix the incoming audio stream to the HDMI output. This Digital to Analog Audio Converter is perfect for connecting devices with a digital audio output to a stereo audio system or other devices such as headphones. This device will convert the digital audio signal from optical or digital coaxial to L/R RCA and 3.5mm. This Additional Receiver expands on the HDMI over IP Extender by allowing a HDMI signal to be distributed through ethernet switches and routers. As there is no limit to the number of receiver units which can be added, this offers extreme versatility. 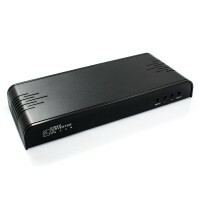 This HDMI over IP Extender offers extreme versatility. Not only does it offer the ability to run a HDMI and IR signal up to 120m, but this fantastic device allows you to route the signal through LAN routers and switches for virtually unlimited AV distribution potential. This VGA to HDMI Converter is perfect for connecting devices with a VGA output to any display with a HDMI connection. Also features a 3.5mm audio input which will mix in the audio for the HDMI output. The internal upscaler will also ensure high quality video conversion. This device converts VGA or Component Video to HDMI. The internal scaler (720p or 1080p) will ensure the highest quality conversion. The L/R RCA and 3.5mm stereo audio input enables audio to be mixed into the HDMI output. VGA Cable and 3.5mm Stereo Cable also included. This groundbreaking piece of technology allows a HDMI signal to transmit up to 200m without cables or wires! To enjoy perfect HD video and audio, simply conect your HDMI source to the sender unit, then connect the receiver unit to your display and you're set. If you are looking for a solution to transmit a HDMI signal up to 50m without cables, this device is perfect. This wireless HDMI extender features a sender and receiver unit with a simple plug and play setup procedure to ensure ease of installation.